Held immediately after arrival. 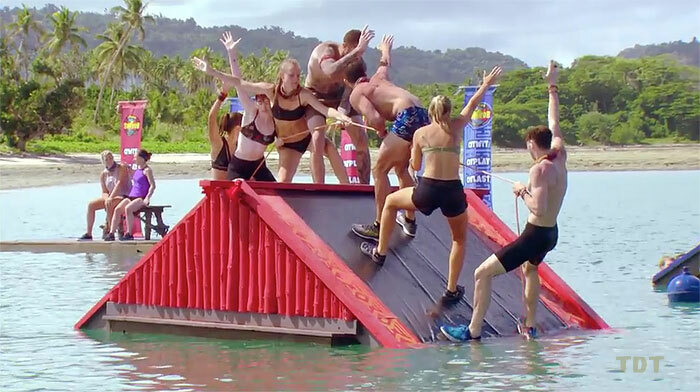 In 1-on-1 matchups, contestants must slide down a water slide, then grab a camp-related item and drag it over to their tribe square, while their opponent tries to do the same. Results: Rd.1: Matt d. Moana (pillow); Rd. 2: Zach d. Steve W. (bag of rice); Rd. 3: Jenna d. Lydia (bag of pineapples); Rd. 4: Shane d. Paige (bag of oranges); Rd. 5: Mat d. Robbie (rope); Rd. 6: Brian d. Heath (flint). 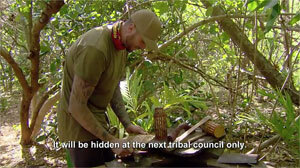 Each tribe gets to keep their retrieved items. 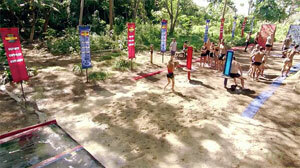 On Day 2 (as shown), Russell wanders off into the forest, spots a tree with crossed limbs, says "X marks the spot," and retrieves the Champions' idol. With much glee and self-congratulation, of course. Ep1 idol: Russell finds one. 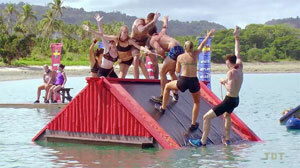 Ten people must work together to go up and over a wall and cargo net, then carry a heavy battering ram under and over a series of obstacles, before using it to smash through a second wall. 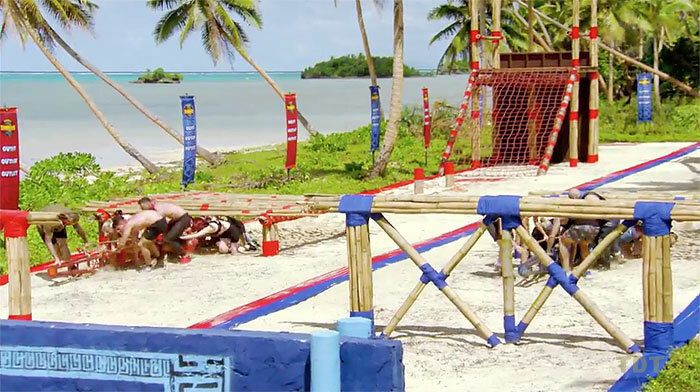 The last two tribemates (Jackie, Damien; Paige, Matt) will use planks from inside the ram to build a hanging puzzle, then knock it down with sandbags. Results: Champs lead early, but are passed by contenders on battering ram. TC1 - Matt D. voted out (7-5), 23 left. Sam sits out. First tribe to seven wins, can choose between comfort items and fishing gear. Results: Rd. 1: Zach d. Steve W.; Rd. 2: Paige d. Monika; Rd. 3: Jenna d. Shane; Rd. 4: Lydia d. Anita (announced as Ch 4, Co 3); Rd. 5: Mat d. Robbie (3-2 Co); Rd. 6: Jackie d. Shonee (3-3 tie); Rd. 7: Brian d. Heath (4-3 Ch); Rd. 8: Sharn d. Tegan (Ch 5-3); Rd. 9: Moana d. Fenella (Ch 6-3); Rd. 10: Russell d. Steve K, Champions win 7-3. They choose comfort items. Damien sits out. 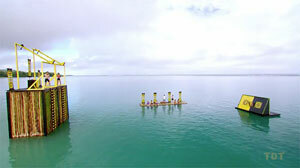 Contestants must run out into the water and one person (Paige, Sam) must collect four hanging buoys from a high bar. 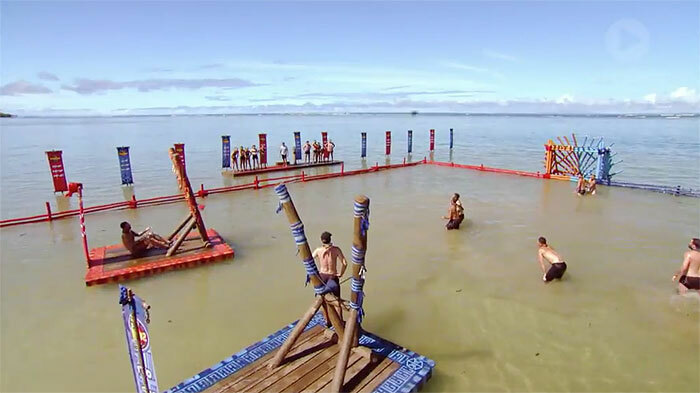 Then climb a high tower, four more (Tegan, Fenella, Jenna, Robbie; Mat, Steve W, Lydia, Shane) dive off one at a time and collect four more tied underwater. When all eight buoys are recovered, two people (Mat, Moana; Heath, Benji) shoot them into a basket (as in various US challenges). Contenders get all four hanging bouys before Champs get any. Also get first eight shots off before Shane returns final buoy. Scoring: Moana-0, Mat-4, Benji-1, Heath-7. Contenders win, 8-4! Ep2 IC: Contenders win, 8-4. TC2 - Russell voted out (4-4-2-2 [9-1]), 22 left. In one-on-one matchups, contestants take a penalty kick into a bamboo soccer goal (striker v. keeper), then switch off with their opponent. First tribe to seven goals wins fishing gear (plus an already-cooked fish). Results: Rd.1: Mat v. Robbie - 0,0; Rd.2: Heath v. Brian (g) - Ch 1, Co 0; Rd.3: Benji v. Samuel (g) - Ch 2, Co 0; Rd.4: Shane v. Tegan (g) - Ch 2, Co 1; Rd.5: Moana (hits the post) v. Jenna (g) - Ch 2, Co 2; Rd.6: Paige v. Lydia (g) - Ch 3, Co 2; Rd.7: Zach (g) v. Jackie - Ch 3, Co 3; Rd.8: Damien v. Fenella - Ch 3, Co 3; Rd.9: Anita v. Sharn (g) - Ch 4, Co 3; Rd.10: Brian (g) v. Heath - Ch 5, Co 3; Rd.11: Benji (g) v. Samuel (g) - Ch 6, Co 4; Rd.12: Monika (g) v. Shonee - Champions win, 7-4. Ep3 RC: (Penalty shoot-out) Champions win, 7-4. Each camp receives a hidden clue, alerting the finder to the presence of an idol hidden in the urn lid, but only at the next Tribal Council. 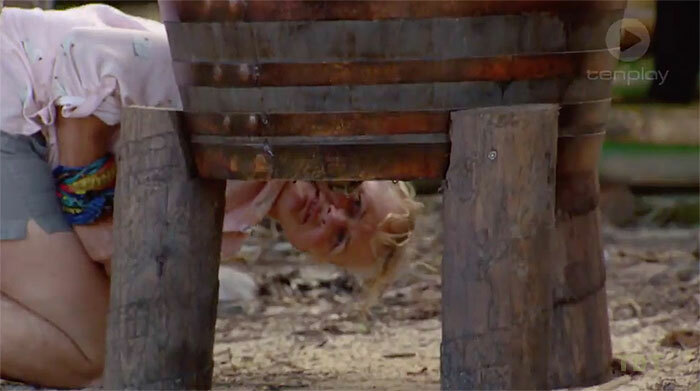 Heath finds the Contenders' clue in their water well. Moana notices the Champions' clue after it falls off the table holding the reward fish. Heath contemplates throwing the IC. Moana just pockets her clue. 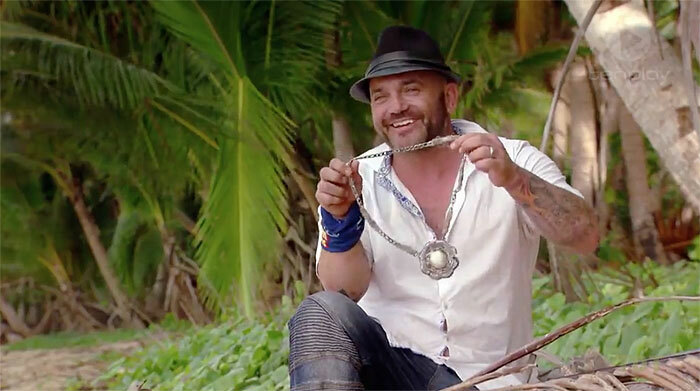 Heath, Moana find idol clues. 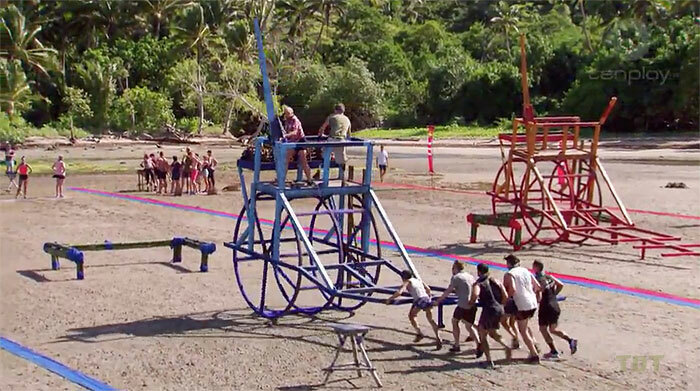 Seven members of the tribe push a chariot with giant wheels around a course, while two more (Anita, Steve K; Damien, Shane) ride in the cart, using a grappling hook to pick up four baskets of puzzle pieces along the way. Final two people (Fenella, Tegan; Monika, Jackie) work a fish puzzle. Champions drop two of their baskets, eating up valuable time. The Contenders win. Ep3 IC: (Giant chariot) - Contenders win. 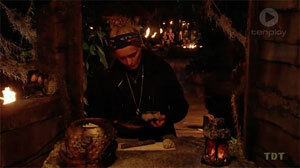 As instructed by her clue, Moana retrieves an idol from the lid of the voting urn at Tribal Council. She pockets the idol, undetected. TC3 - Damien voted out (8-2-1), 21 left. Steve K sits out. As seen in Cook Islands (etc. 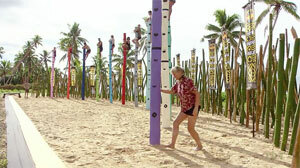 ), one person holds on to a pole, while two members of the other tribe try to drag them off of it. First tribe to score three points wins a vanity with hygiene items. Rd.1: Samuel, Mat vs. Heath; Zach, Robbie vs. Brian - Contenders win (Ch 0, Co 1). Rd.2: Moana, Sharn vs. Paige; Fenella, Jenna vs. Jackie - Champions win (Ch 1, Co 1). Rd.3: Brian, Mat vs. Heath; Robbie, Benji vs. Steve W - Contenders win (Ch 1, Co 2). Rd.4: Monika, Shane vs. Shonee; Tegan, Anita vs. Lydia - Champions win (tied, 2-2). 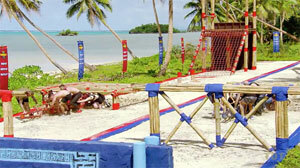 Rd.5: Moana, Lydia vs. Jenna; Fenella, Paige vs. Jackie - Jenna injured, no score. Rd.6: Moana, Sharn vs. Paige; Anita, Fenella vs. Lydia - Champions win, 3-2. Ep4 RC: "Kicking and Screaming" - Champions win, 3-2. Jenna sits out. Three people (Sam, Brian, Steve W; Zach, Benji, Robbie) must chop through a rope to release a giant ball. 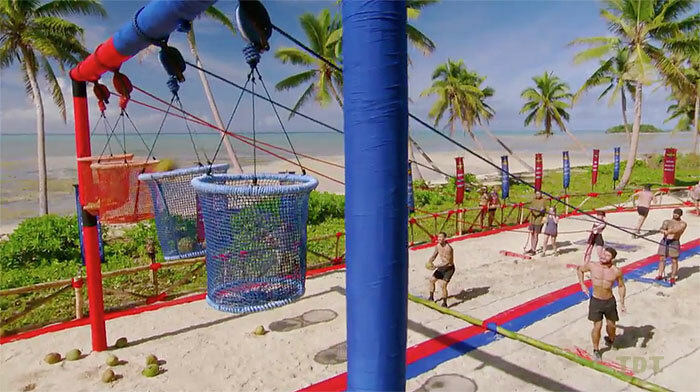 Then all eight roll it under a net, until they come to a steep ramp, where they'll use another rope to scale the ramp, then hoist the ball over the top. Finally, throw the rope over a beam, and two people (Shane, Mat; Steve K, Heath) swing the ball to smash targets. First tribe to smash all targets wins. Contenders have a lead for most of the challenge, but the Champions pass them on the smashing, and win. Ep4 IC: (Wrecking ball) - Champions win. TC4 - Steve K. voted out (6-4-1), 20 left. Eight tribemates use three barrels and two planks to cross the field without touching the ground. 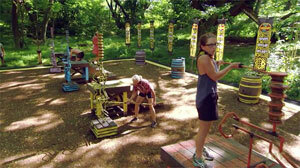 Then two more (Zach, Jenna; Brian, Jackie) use a grappling hook to retrieve two sets of two balls. The tribe must then balance those four balls on a seesawing frame. First tribe to do so wins. 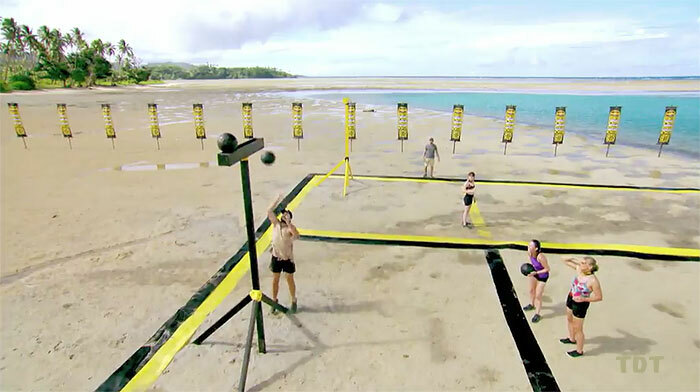 Champions cross and retrieve all their balls before Contenders get across. 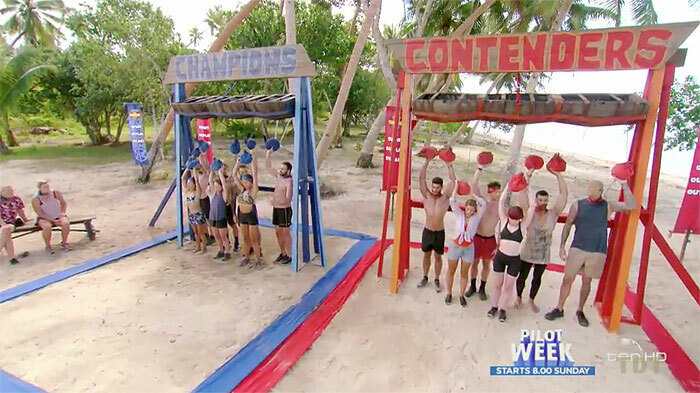 Contenders figure out they need to place two balls at once to balance them, which Champions quickly adopt. 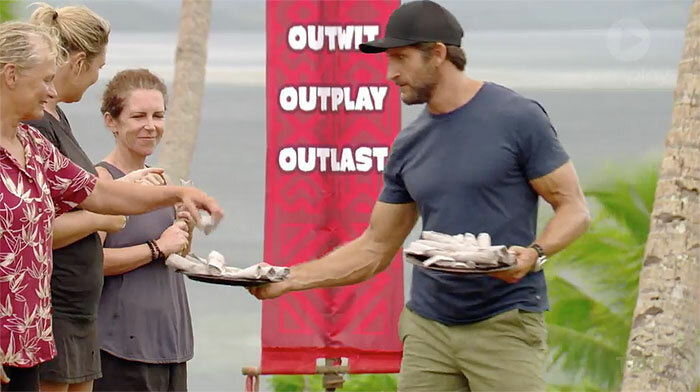 Contenders' balls all drop, and Champions win a Survivor pub trip, with meat pies and beer. Ep5 RC: (Barrels and balls) - Champions win. Jenna is taken away in a helicopter for medical evaluation before the challenge. Shane sits out. 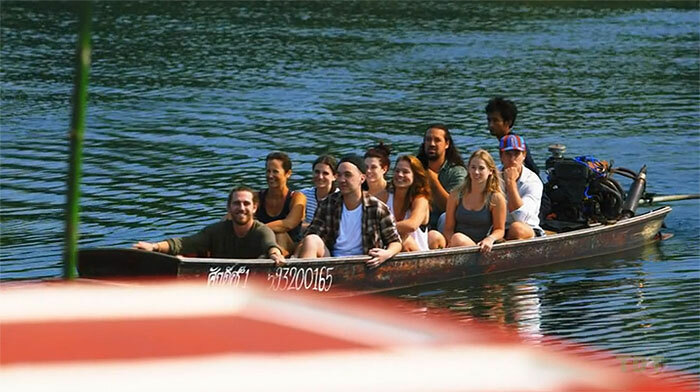 Six tribe members go down a slide, into the water, get in a canoe, and paddle out to retrieve three rings. 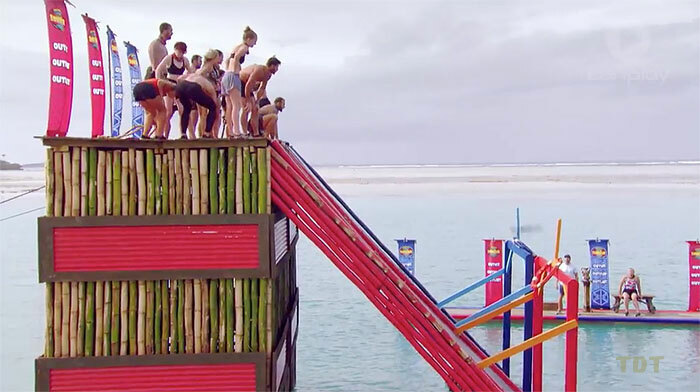 They bring them back, go up the slide, then the remaining three (Zach, Anita, Paige; Moana, Mat, Jackie) must each toss a ring onto a peg above the bottom the slide. Rings: Mat-1, Jackie-1, Zach-1, Moana-1... Champions win, 3-1. Ep5 IC: (Slide, canoe, rings) - Champions win, 3-1. TC5 - Jenna voted out (9-1), 19 left. Jackie sits out. In one-on-one matchups, contestants stand on a barrel, holding a rope in a tug-of-war to try to pull their opponent off their barrel. First tribe to seven wins reward: Bacon and egg rolls with iced coffee. Results: Rd.1: Mat d. Robbie (Ch 1, Co 0). Rd.2: Steve d. Zach (Ch 2, Co 0). Rd.3: Lydia d. Shonee (Ch 3, Co 0). Rd.4: Samuel d. Benji (Ch 4, Co 0). Rd.5: Fenella d. Sharn (Ch 4, Co 1). Rd.6: Heath d. Brian (Ch 4, Co 2). Rd.7: Monika d. Anita (Ch 5, Co 2). Rd.8: Shane d. Tegan (Ch 6, Co 2). Rd.9: Moana d. Paige (Ch 7, Co 2). Champions win reward! Contenders then choose Mat and Steve to face off in a bonus match for a full breakfast. Mat wins, has to pick a Contender to join him. He picks Paige. 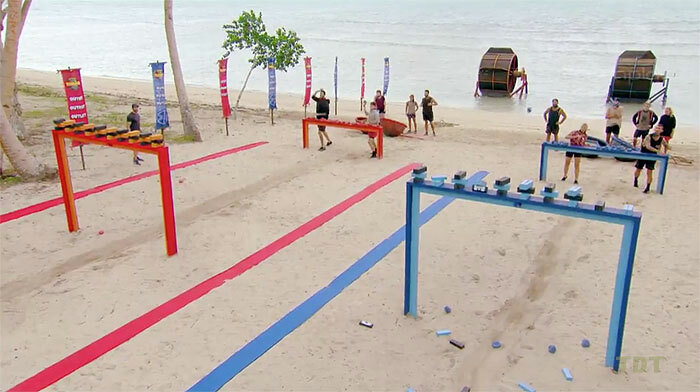 Ep6 RC: (Tug of war) - Champs, Mat win. Following the reward feast, Shane commences her usual activity of searching the reward items for idols and/or clues. She finds an idol underneath the ice bucket that contained their iced coffees. Unfortunately, just about everyone in the tribe saw her do it, except Mat, who was off at his own private feast. Moana sits out. Two tribe members (Anita, Tegan; Lydia, Monika) are locked inside a coffin-like cage. 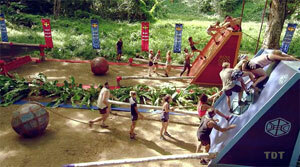 Rest of the tribe then carries the cage through two obstacles, up a ramp, and down a slide. 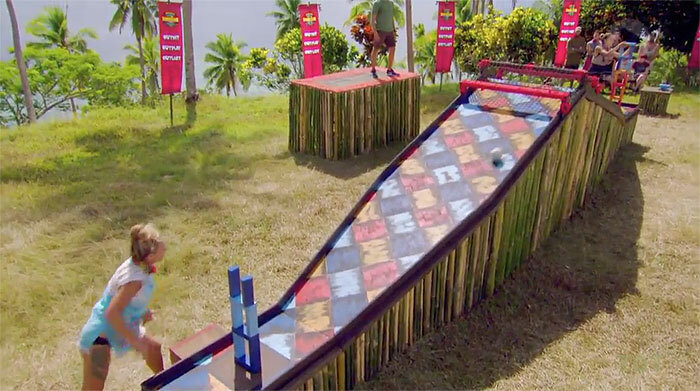 When both are down the slide, people toss coconuts at three glass targets. First tribe to smash all three wins. Champions fall way behind due to Shane and Jackie's difficulty crossing the obstacles. They catch up enough to smash one target, but Contenders win. Ep6 IC: (Sliding coffins) - Contenders win. TC6 - Moana voted out (7-), 18 left. Heath notices an idol clue tucked into the Contenders' tribe flag. It tells him there is an idol buried under the flag, which is (unfortunately for Heath) in full view of the camp. Heath recruits Tegan, who leads the tribe away to find papayas at the other end of the beach. Except Zach, who is looking for idols himself. 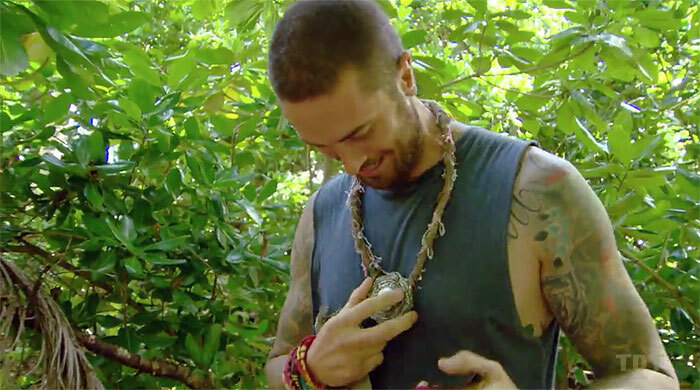 After Zach heads away, Heath digs up the idol, and pockets it. 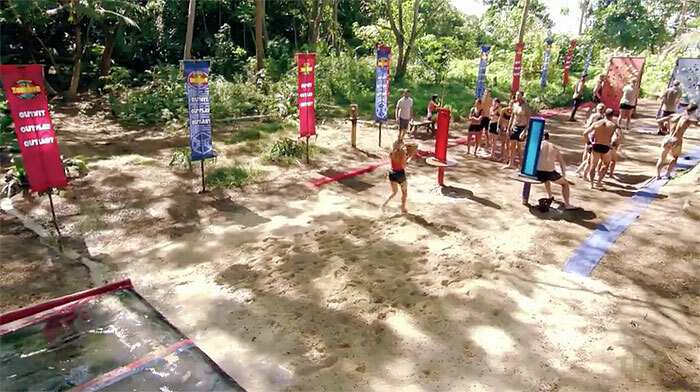 In 3-on-3 matchups, tribe members race to get a ball, then pass it to a fourth tribe member, who attempts to shoot it into a goal with a slingshot. First tribe to three goals wins. Results: Rd.1: Steve, Mat, Brian (Jackie) v. Rob, Benji, Heath (Fenella) - Fenella takes shot, misses; Jackie shoots, scores. Rd.2: Robbie, Tegan, Paige (Zach) v. Sharn, Mat, Lydia (Sam) - Lydia passes to Sam, who scores (Ch 2, Co 0). Rd.3: Tegan, Anita, Shonee (Fenella) v. Shane, Monika, Lydia (Jackie) - Jackie hits the crossbar, Anita passes to Fenella, who scores! (Ch 2, Co 1). Rd.4: Brian, Steve, Mat (Sam) v. Benji, Robbie, Zach (Heath) - Zach passes to Heath, he scores (Ch 2, Co 2). Rd.5: Sharn, Lydia, Mat (Jackie) v. Heath, Tegan, Paige (Fenella) - Fenella hits the crossbar, Lydia gets it to Jackie... Champions win, 3-2. Ep7 IC: (Slingshot basketball) - Champions win, 3-2. TC7 - Tegan voted out (7-1-1), sent to Exile. Monika sits out. As seen in Palau, etc. Three tribe members at a time are tethered together and each carrying a weighted bag. They must run around an oval course (in knee-deep water), being chased by the other tribe. Bags can be handed off, but players have to stay in. First tribe to three points wins reward: gifts from home. Rd.1: Brian, Sam, Sharn d. Robbie, Fenella, Benji (Ch 1, Co 0). Rd.2: Mat, Steve, Lydia d. Zach, Anita, Shonee (Ch 2, Co 0). 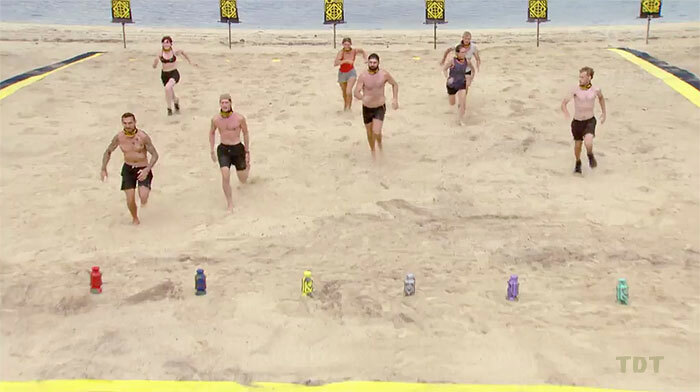 Rd.3: Zach, Paige, Heath d. Lydia, Shane, Jackie (Ch 2, Co 1). Rd.4: Brian, Sam, Sharn d. Zach, Paige, Fenella (Ch 3, Co 1). Champions win reward. Ep8 RC: "Hot Pursuit" - Champions win, 3-1. Shane sits out. Like "When It Rains," but a tribal challenge. Each tribe member holds a 7-kg sandbag over their head, tied to a trough of water. Each person can drop out by handing their sandbag to a tribemate, but if a bag drops, the trough tips, and the tribe gets soaked (and loses). 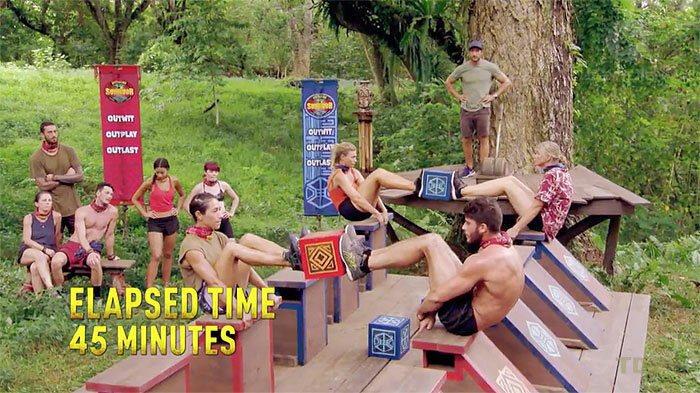 Results: Anita out (~3 min, to Robbie), Jackie (~10 min, to Brian), Paige (to Zach), Shonee (to Benji), Monika (to Steve), Fenella (~20 min to Benji), leaving every Contender guy with two bags. Eventually, Robbie drops, and Champions win. TC8 - Anita idoled out (-1), sent to Exile. Tegan v. Anita, competing to return to the game. Each must build a tower of 20 blocks at the bottom of a ramp, while also flinging a ball up the ramp to knock over their opponent's tower (and protecting their own tower from the ball). First to put all 20 blocks up wins. That person is Tegan; Anita is eliminated. 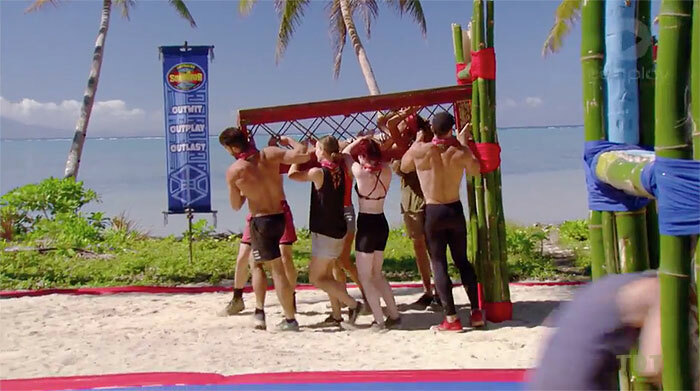 Ep9 Duel: Tegan wins, re-enters game. Anita out, 17 left. Monika sits out. 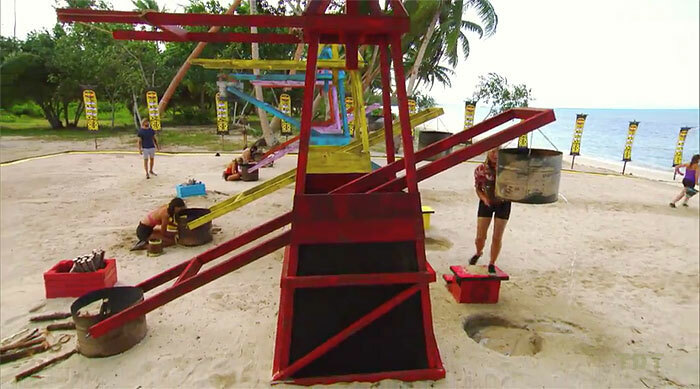 One at a time, six contestants will run up a slide, fill a bucket (with holes in it) with water, slide back down, and use remaining water to fill a tube. 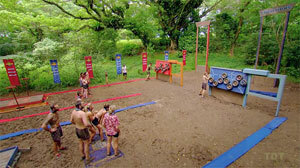 When the tube is full, it will release a ball, which the final two tribemembers (Zach, Robbie; Jackie, Sam) will use to navigate through a vertical swiss-cheese maze. First team to place their ball wins. The Champions are first to the maze, make it all the way to the too, then drop their ball once before the Contenders even start. Champions win. Ep9 IC: (Slide, maze) - Champions win. TC9 - Zach voted out (7-1), 16 left. Contenders receive gifts from home. Jackie, Sharn sit out. 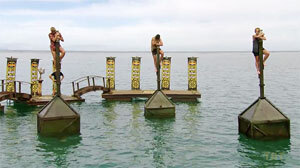 One at a time, tribe members jump off a high platform and grab a piece of rope, then swim over to a ramp. Once all are to the ramp, they must tie the ropes together, and use the combined rope to climb up the ramp. 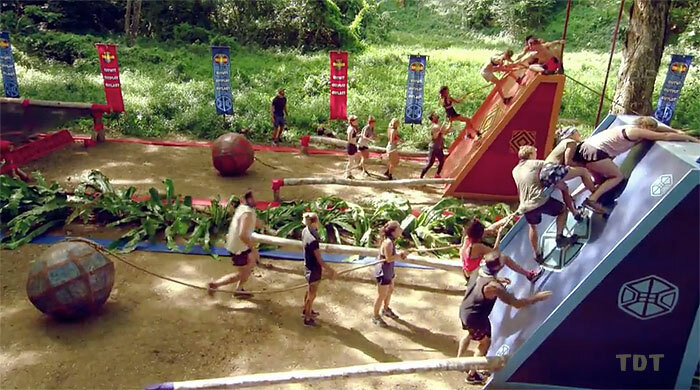 First tribe to have all tribe members balanced on ramp (holding rope, one arm raised) wins a family-style nacho feast. Monika goes second, misses her rope. And misses on her second try. 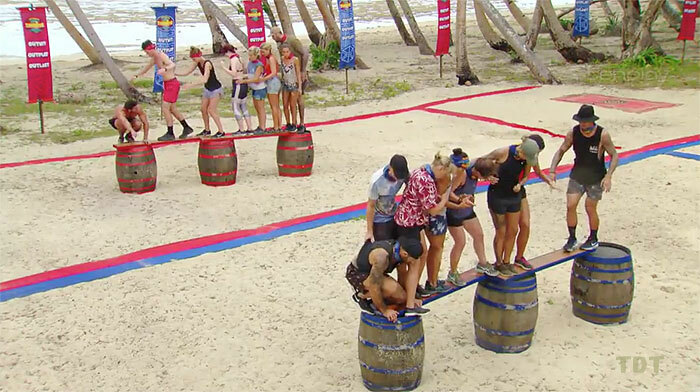 While both tribes eventually have their ropes tied together and are climbing the ramp, the Contenders win. But... the reward has to be shared: People eat one at a time, and decide how much to leave (as in HvHvH). 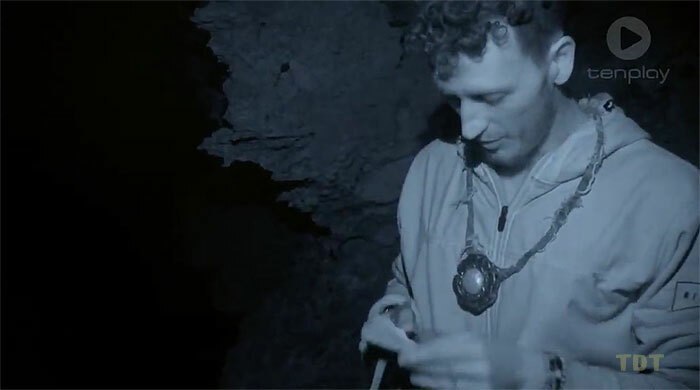 Benji finds an idol clue written on the plate under the pile of nachos. 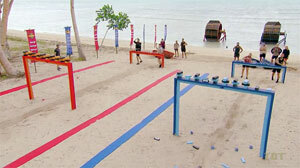 Ep10 RC: (Ropes, ramp) - Contenders win. Ep10 IC: "Nut Bucket" - Champions win. TC10 - Paige voted out (6-1), 15 left. Both tribes assemble, talk about how well they've bonded. Then all are forced to select new, wrapped buffs. Surprisingly, only five people end up changing tribes: Shonee and Tegan join the Champions, while Lydia, Monika, and Sharn move over to the Contenders. 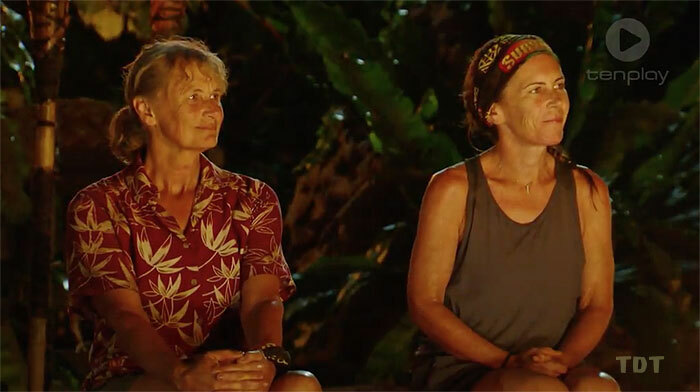 Tribal swap: Two new tribes formed. Heath sits out for Contenders, Jackie and Brian for Champions. In pairs, tribemates attempt to hold up a wooden block between them, using only their feet (pushing on each side). If they drop it, they're out. First tribe to drop all their blocks loses. 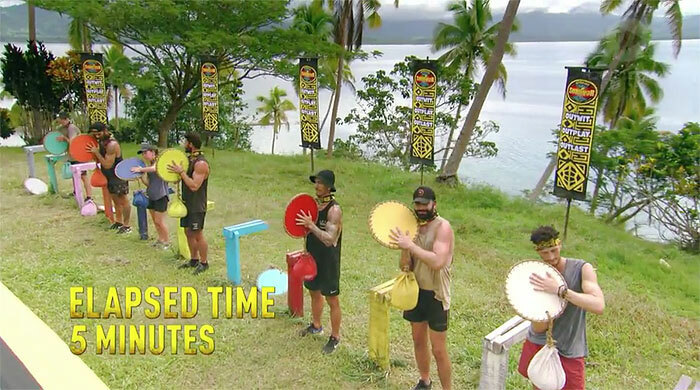 Results: Sam/Tegan drop first, then Monika/Fenella, [10 minutes] then Steve/Mat, [20 minutes] then Sharn/Benji... [45 minutes] down to Shonee/Shane vs. Lydia/Robbie. Shane and Shonee drop, and the newly reshuffled Contenders win! Ep11 IC: (Feet, blocks) - Contenders win. TC11 - Jackie voted out (4-2-1-1), 14 left. 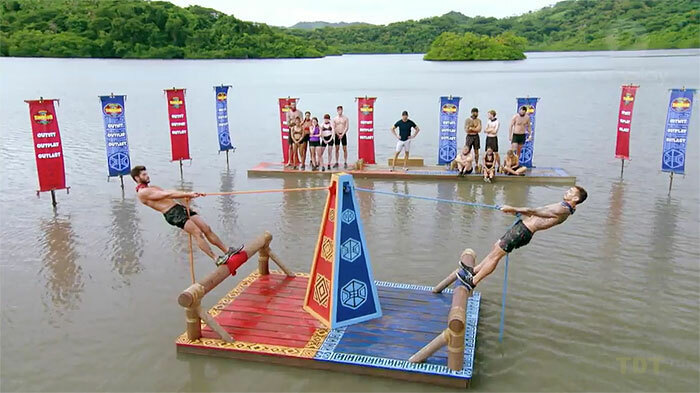 In 1-on-1 matchups, hang on to a rope, lean out over the water until one person drops. First tribe to three points wins a roast pork feast. Rd.1: Robbie (finally) d. Mat (Co 1, Ch 0). Rd.2: Heath d. Brian (Co 2, Ch 1). Rd.3: Steve d. Sharn (Co 2, Ch 1). Rd.4: Fenella d. Tegan, Contenders win reward (3-1)! Ep12 RC: "Splash Back" - Contenders win, 3-1. 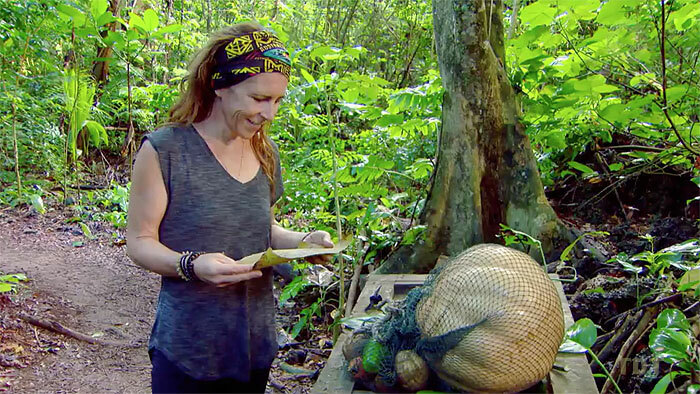 Four days after digging the idol clue out from under a mountain of nachos, Benji finally gets around to retrieving the idol, in the middle of the night (Day 27/28). Sharn gets up to tend the fire while Benji is away, but his full-dark, low-tide trip to the adjacent island is apparently both successful (he gets the idol) and undetected. 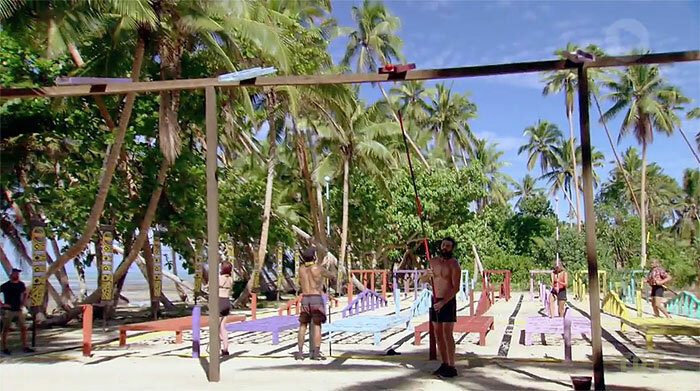 Two tribe members (Robbie, Lydia; Mat, Steve) will transport four pairs of tires (tied around their waist) over a set of monkey bars. Then four people will attach those tires to a cart, which the last person (Heath; Sam) will use to pull the rest of the tribe through an obstacle course. 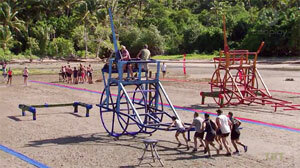 Finally, tribes must disassemble the cart, and the puller (Heath, Sam) will use the tires to solve a gear puzzle. 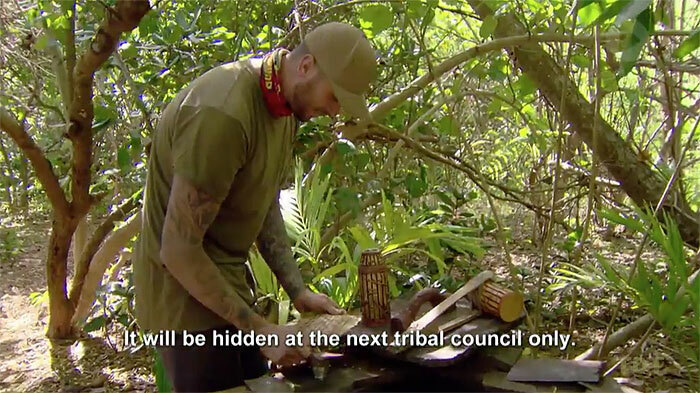 Winning tribe also gets to attend losing tribe's Tribal Council. 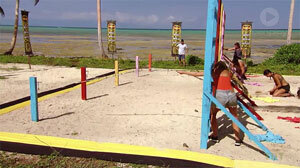 Contenders have a lead going into the puzzle, but Sam finishes first... and somehow doesn't raise the flag first. Ep12 IC: (Carts, wheels) - Contenders win. Monika sits out. Two people (Steve, Brian; Lydia, Robbie) use a rope to pull two heavy metal buckets containing sandbags. Two more people (Mat, Shane; Benji, Heath) use sandbags to knock blocks off a beam. Final two people (Sam, Shonee; Sharn, Fenella) use those blocks to solve a word puzzle (EVERY CHAMPION WAS ONCE A CONTENDER). Results: Champions get both buckets in the time it takes Lydia to get hers. Contenders catch up a bit on blocks, but Champs first to the puzzle. Ep13 IC: (Blocks, puzzle) - Champions win. TC13 - Heath voted out (5-2), 12 left. 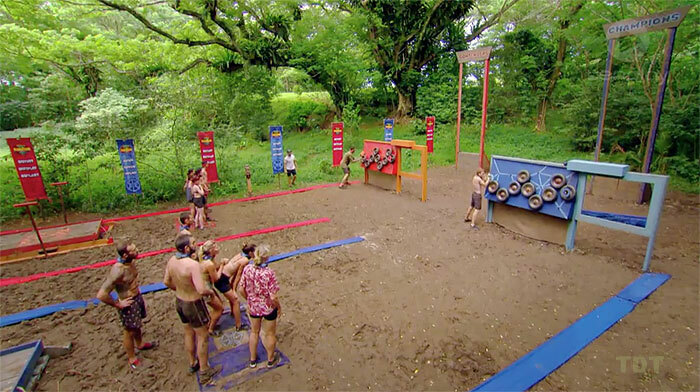 Both tribes come together, drop their buffs, then immediately partake in a Survivor Auction. Rules as usual - $500, bids in $20 increments, no sharing money or items. Results: Item 1. Chocolate milk to Sam, $80. Item 2 (covered) to Shane, $250… it's a scroll saying "You have just bought yourself out of the auction, but gained a seat at the beggar's table." Item 3. Eggs and tomato on toast - Fenella, $200. Item 4. A pavlova - Sharn, $320. Item 5 (covered) to Brian, $320 - it's a bowl of rice. Item 6 (also covered) to Benji, $460 - cheeseburger, fries, Coke. Item 7. Jar of candy - Shonee, $500 (which has an idol clue in it). Item 8. Three nights of a mattress and pillows at camp - Brian, $160. Last item (shown, other people won unaired items). Tribes merge, Koro Savu formed. Ep14 non-RC: "Survivor Auction" - Shonee buys vote steal. 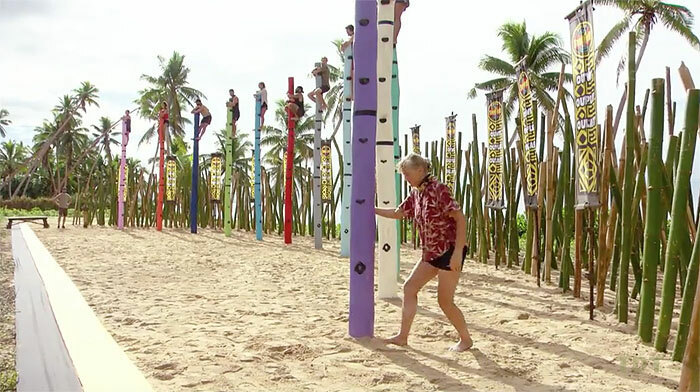 Instead of grooves, poles have climbing holds on them, contestant start off on large one, move down in increments. Results: 12. Shane climbs down immediately; 11. Monika (fear of heights) requests a ladder, joins Shane; 10. Brian next. Rest last 1 hr in the large-foothold zone, move down to next-smaller zone. 9. Robbie, 8. Steve, 7. Benji, 6. Shonee. [Two hours] 5. Fenella, 4. Mat. At 2 hrs, 45 minutes, the three left move down into the smallest footholds: 3. Sam [Four hours] 2. Lydia slips, 1. Sharn wins! Ep14 IC: "Get a Grip" - Sharn wins. TC14 - Lydia voted out (9-3), 11 left. 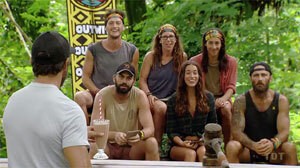 The tribe receives treemail telling them to select one person to go into the jungle and choose one option in a moral dilemma. Sharn is selected, and must choose between taking a large bag of vegetables for the tribe, or a smaller bag plus an advantage for herself. 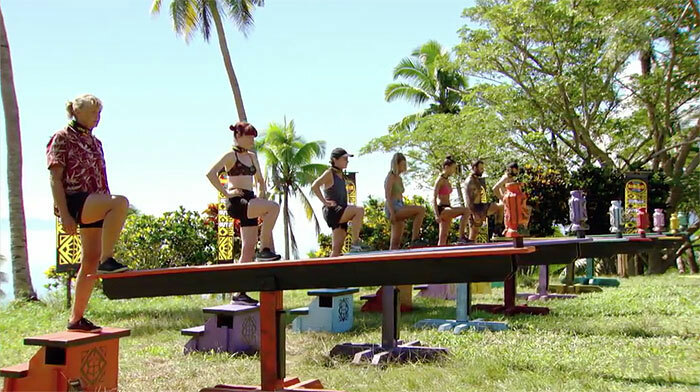 Sharn selects the latter, the advantage turns out to be an IC advantage, allowing her to hold half the normal weight in the challenge. Contestants must hold up a disc with their palms; the disc is weighted down by a sandbag, proportional to bodyweight. (Sharn's advantage secretly gives her half the weight she would otherwise have.) Last person standing wins. Order of elimination: 11. Monika, 10. Shonee, 9. Shane, 8. Fenella, [5 minutes] 7. Sam, 6. Steve, [15 minutes] 5. Brian, [20 minutes] 4. Benji, 3. Robbie, 2. Mat (makes a deal with Sharn), 1. Sharn wins again! Ep15 IC: (Disc hold) - Sharn wins. After lying on their stomachs, contestants must race across a sandy field, grab an "idol" (a vase), then run back to the finish line. In each round, there will be one fewer idol than contestants, and one person will be eliminated, until only one is left. 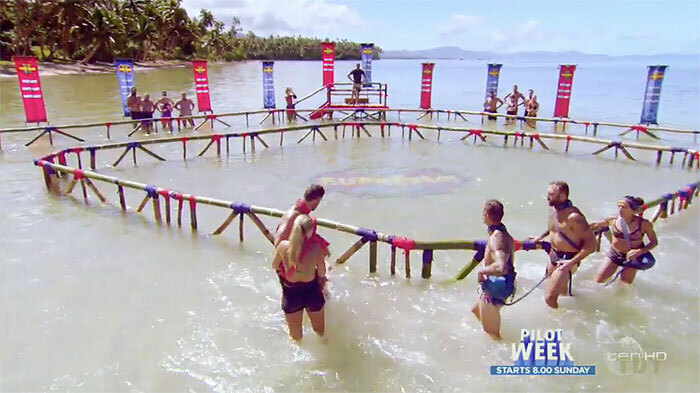 Winner gets a trip to "the ultimate Survivor spa." Order of elimination: 10. Monika, 9. Steve (drops out, thinks others would like the reward more), 8. Shane, 7. Shonee, 6. Fenella, 5. Sharn, 4. Sam, 3. Brian, 2. Benji. 1. Mat wins, picks Fenella and Sharn to join him. Ep16 RC: (Idol race) - Mat wins spa trip. As originally seen in Palau. Contestants must stay in the water, under a grate as the tide comes in, until they drop out. Elimination order: [all last 50 minutes] 10. Sam, 9. Shonee, 8. Steve, 7. Monika, [1 hour] 6. Sharn, 5. Fenella, 4. Benji, [1 hr, 15 min] 3. Brian, 2. Shane, 1. Mat wins! 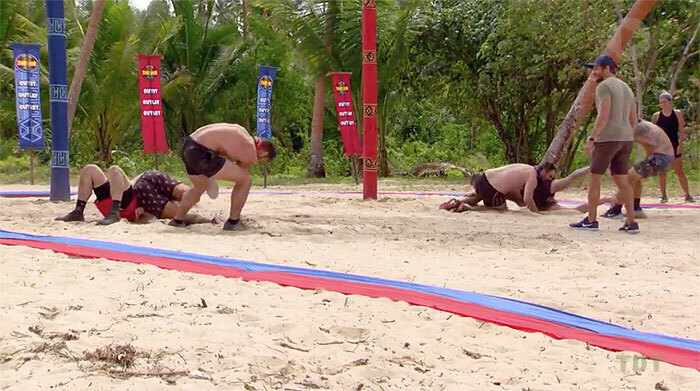 Ep16 IC: "Last Gasp" - Mat wins. Run in three stages. 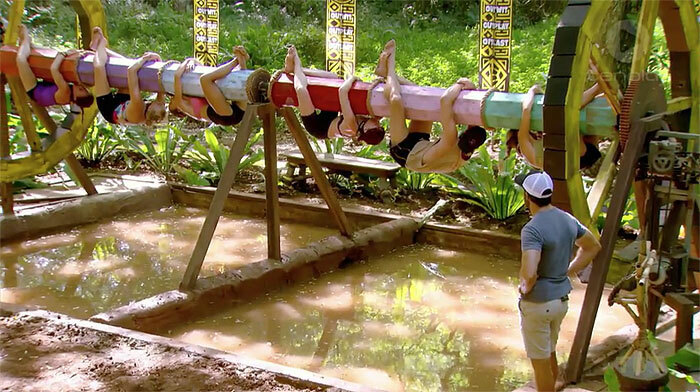 Stage 1: Contestants must dig and get their body under a log. First six advance. 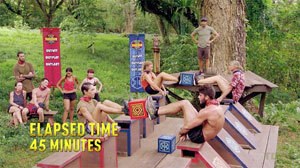 Stage 2: Survivor logo puzzle. First three to finish advance. Stage 3: Use a cue to sink three balls on a Survivor snooker table. 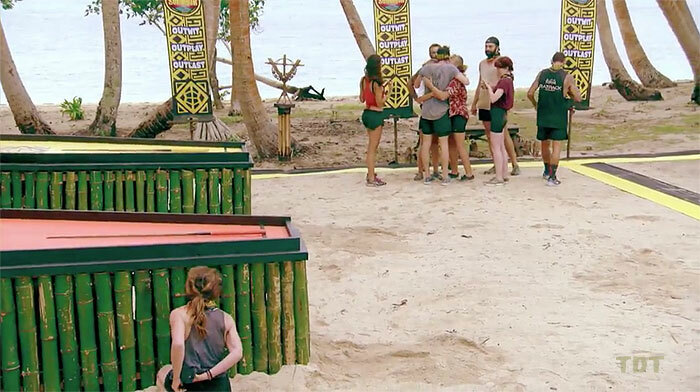 First to get all three in their holes wins immunity. Results: Stage 1: Steve, Benji, Mat, Shonee, Brian, Shane advance. Stage 2: Brian, Shonee, Benji advance. Stage 3: Benji wins (3 balls placed), Brian second (2), Shonee third (1). Ep17 IC: (Logs, puzzle, snooker) - Benji wins. After finding a clue at the water well that told her the idol would be at the final stage of the IC, Sharn watches the final two stages from the sidelines. Then she (semi-stealthily) goes over to Benji's snooker table, finds the idol, and stuffs it in her pants. 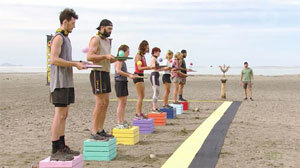 While walking back to the contestants, the idol slips out, and falls to the ground. Everyone sees it. Sharn finds idol at the IC. TC17 - Mat voted out (5-4), 8 left. 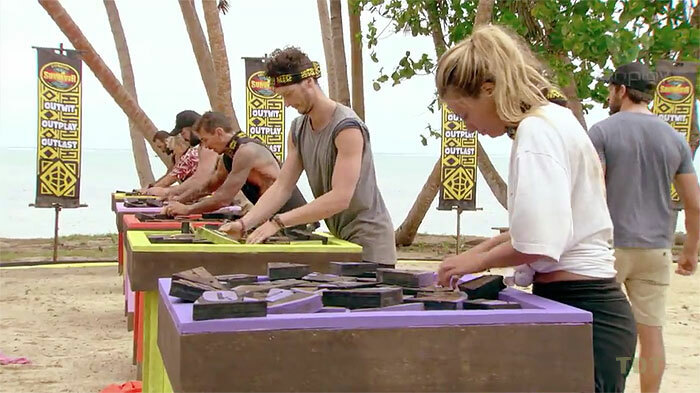 Two teams of four, schoolyard pick, captains (Benji, Shane) selected by random draw: Yellow (Shane, Brian, Sharn, Monika) vs. black (Benji, Steve, Fenella, Shonee). 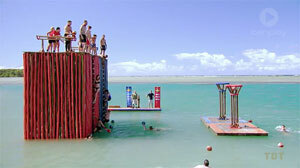 Each team starts on the tower in the water. 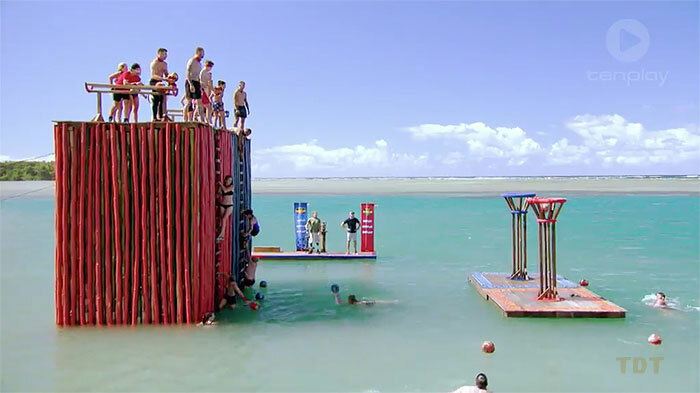 One person from each team releases a ball down a chute, then jumps into the water to retrieve it, using it to shoot a basket, while racing someone from the other team. First team to three points wins fried chicken and chips reward. Results: Fenella d. Shane (B1, Y0); Benji d. Monika (B2, Y0); Brian d. Steve (B2, Y1); Sharn d. Shonee (B2, Y2); Shane d. Fenella... Yellow wins, 3-2! 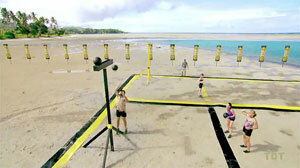 Ep18 RC: (Water b-ball) - Yellow team wins. After everyone is done eating at the reward, Brian semi-jokingly makes a show of looking for an idol. He finds a clue in the ice bath for the drinks, and manages to palm it without anyone noticing. After reading that the idol is under a stair at the reward, he concocts a plan to go back for his water bottle when everyone leaves. He does so, and grabs the idol. Brian finds idol at reward. 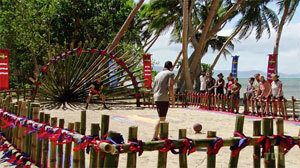 Contestants must stand on a box and bounce a ball on a disc. If they drop the ball or step off, they're out. Order of elimination: 8. Shonee, 7. Monika, 6. Fenella, 5. Sharn, [10 min.] 4. Shane, [1 hour, switch to one hand on the disc] 3. Benji, 2. Steve, 1. Brian wins! 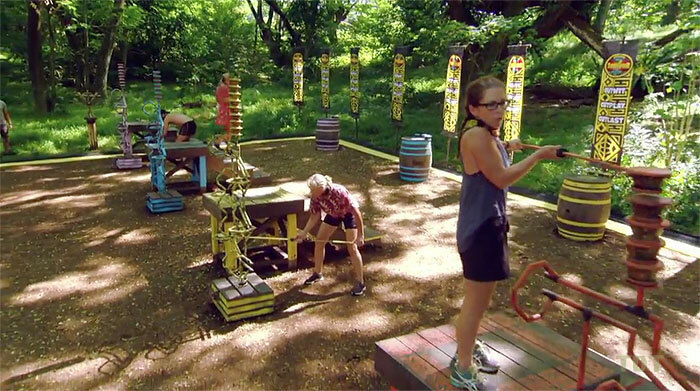 Ep18 IC: (Bouncing balls) - Brian wins. TC18 - Benji voted out (4-4 [5-1]), 7 left. As seen in Redemption Island. Contestants must prevent a vase from falling off a see-saw by placing one leg on the other end, and holding it as long as possible. Last person standing wins. Elimination order: [5 min.] 7. Shane, [7 min.] 6. Fenella, 5. Sharn, [10 min.] 4. Steve, [12 min.] 3. Brian, [17 min.] 2. Monika, 1. Shonee wins! 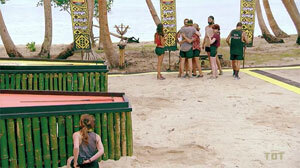 Ep19 IC: "A Leg Up" - Shonee wins. TC19 - Steve voted DMW (4-3), 7 left. 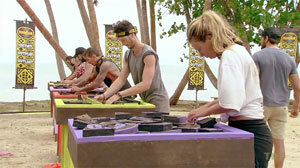 Contestants compete in two team of three, picked by rock draw: Yellow - Fenella, Shonee, Monika; black - Brian, Shane, Sharn. One at a time, two people (Shonee, Monika; Sharn, Shane) read combo tiles, paddle out to a pontoon, and decipher a puzzle board on the other side (counting colored tiles). They then paddle back and try to unlock the combination lock. This releases three balls, which the third person (Brian; Fenella) must land in a high gutter. Winners get an Indian feast. 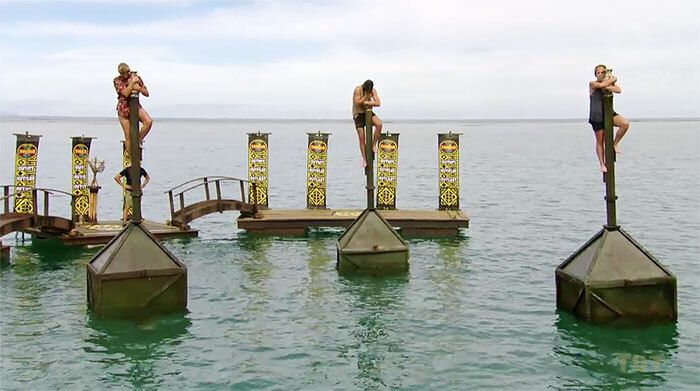 After Monika paddles past the puzzle board, the black team takes a huge lead, and Brian lands all three balls before yellow solves their combination. Ep20 RC: Combo puzzle, balls - Black team wins. Ep20 IC: "Ram-Ball On" - Brian wins. TC20 - Steve voted out (2-2-2 [3-1]), 6 left. 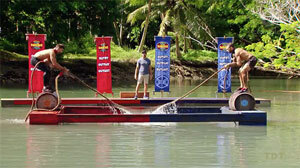 Contestants must hold on to the axle of a giant wheel. Jonathan then turns a crank, the wheel then rotates, hanging them all upside-down. Last to fall off wins. All last 10 minutes, order out: 6. Fenella; [15 min.] 5. Sharn, 4. Shane; [25 min.] 3. Monika; [30 min.] 2. Shonee, 1. Brian wins. Ep21 IC: (Axle hang) - Brian wins. Contestants must solve an arched vertical word puzzle (Commodore Tourer), then climb along a beam to release two bags of sticks and rope. Then use the sticks and rope to make a long pole, and use that pole to reach through a gate a retrieve a set of car keys for the reward car: A Holden Commodore Tourer. Results: Order to beam = Brian, Shonee, Shane, Sharn, Monika. Same order to sticks. All reach the sticks, all but Monika attempt to get the key, but Brian eventually wins. Also gets night away, plus pizza. He picks Monika to join him. Ep22 RC: Brian wins a car, pizza. As seen in Survivor: The Australian Outback. Build a fire in a bucket on one arm of a see-saw contraption. Once burning, fill a barrel on the other arm with water, raising the fire up high enough to burn through a rope. First to do so wins. Shane, Sharn first to fire; Sharn first to raise her bucket. Sharn wins! Ep22 IC: "Fire and Water" - Sharn wins. As seen in the Survivor: One World F4 IC. Stack 12 bowls ("discs") after navigating them on a pole through a narrow, wobbly maze on a spring. First to finish wins. Brian, Shane race through the first 12 bowls, neck and neck. Brian gets to 12 first, but his stack drops. Then Shane: her stack drops, too. Then Shonee: yup, stack drops. Sharn is then the leader, and hers falls at around 11 stacked. Brian wins on his second attempt. Rest tied for 2nd. Ep23 IC: "Operation Balance Build" - Brian wins. TC23 - Shonee voted out (2-1-1), 3 left. 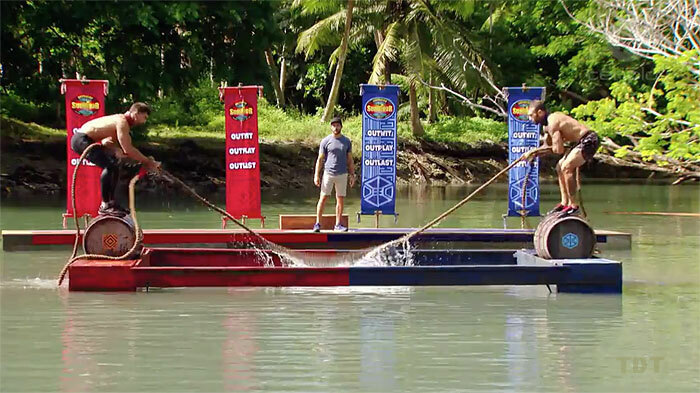 As seen in the Survivor: Palau F3 IC. Contestants must hold onto an idol on top of a buoy with both hands, with their feet on narrow ledges. Until they can't. Order out: 3. Shane (1 hr, 18 min), 2. Brian (2 hrs, 15 min. ), 1. Sharn wins! 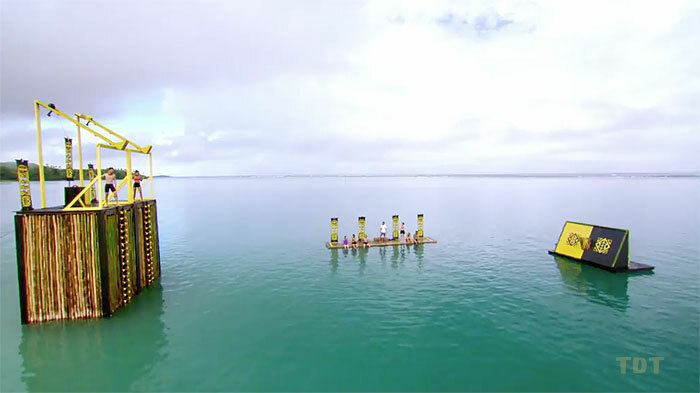 Ep24 IC: "Bob-Bob-Buoy" - Sharn wins. The final two (Sharn and Shane) deliver their opening statements, then field questions from the jury in an open forum setting. The jury then votes for a winner. The results are extremely close: Shane wins, 5-4. Cast returns home, resumes Instagram posting.